This bulbous perennial enhances the exotic look in your garden. It has very fleshy leaves and stunning flowers in late summer. Best planted in large groups for a lush effect. Bulbous perennial forming a large basal rosette of fleshy, strap-shaped leaves, fresh green in colour, wavy margins, with an erect, purple-spotted stem bearing a dense raceme of star-shaped, pale green flowers, scented, each tepal edged with maroon, topped by a crown of leafy bracts, the long-lasting flowers appear from late summer onwards until late autumn, excellent choice for a tropical appearance to temperate gardens, best planted in groups. 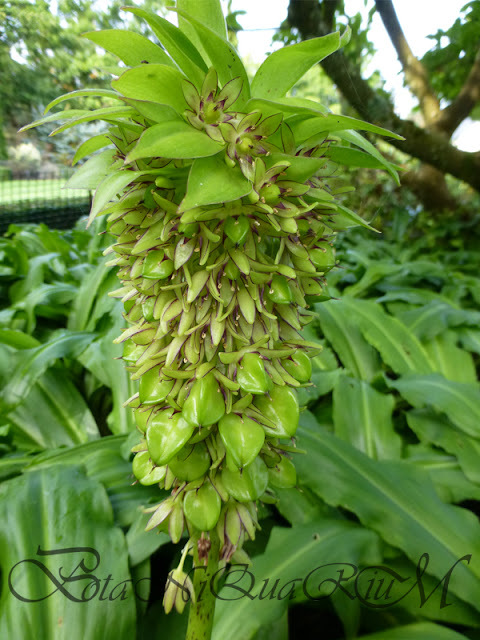 Eucomis bicolor was described in 1878 by English botanist John Gilbert Baker. Eucomis bicolor at its best: in flower. Very little maintenance required, remove leaves when gone yellow at the end of the season, depending on soil and location might benefit from a layer of mulch, pot grown specimen need plenty of water during the growing period, stop watering as soon as leaves turn yellow and keep on the dry side, replant into fresh compost in spring before growth has started. Bulb offsets are easily divided and moved elsewhere or potted on, best done in spring. Those will take a couple of seasons to reach flowering size. South Africa, incl. Lesotho and Swaziland; forest and grassland, often on mountain slopes, cliffs and along watercourses, up to 2800m above sea level. E. bicolor named after the two-coloured flowers. Prefers rich and moist soils in a sheltered position, will grow on loam, chalk or sand in any pH, acid or alkaline, will not tolerate wet clay soils, thrives in full sun but will also grow well in partial shade, protect from strong winds as it would ruin the flowers, suitable for growing in containers on patios, keep well watered during the growing period only. Pests and Diseases: Slugs might be a problem, especially during warm and wet summers. 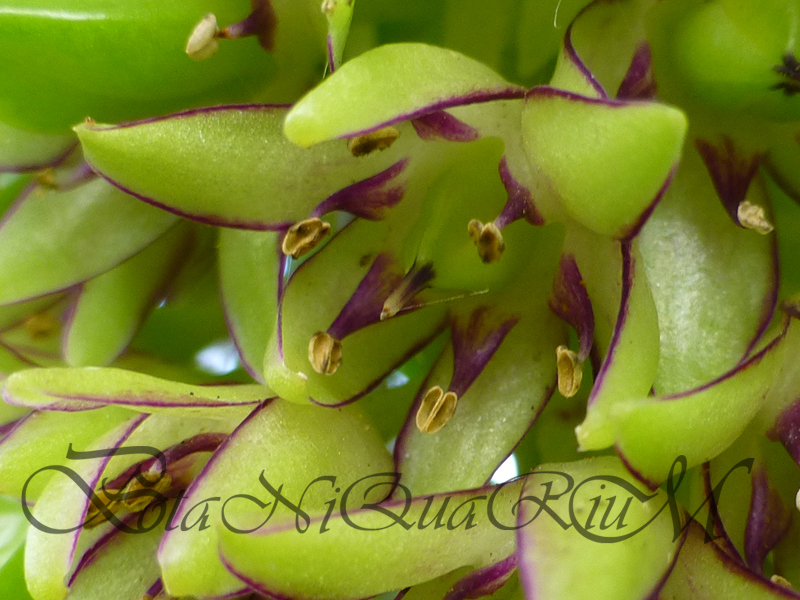 Pineapple lily is threatened by collection from the wild for use in traditional medicine. 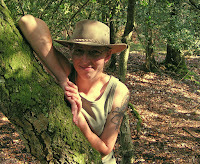 This practice is thought to be responsible for a 20% reduction in populations in the last 75 years. 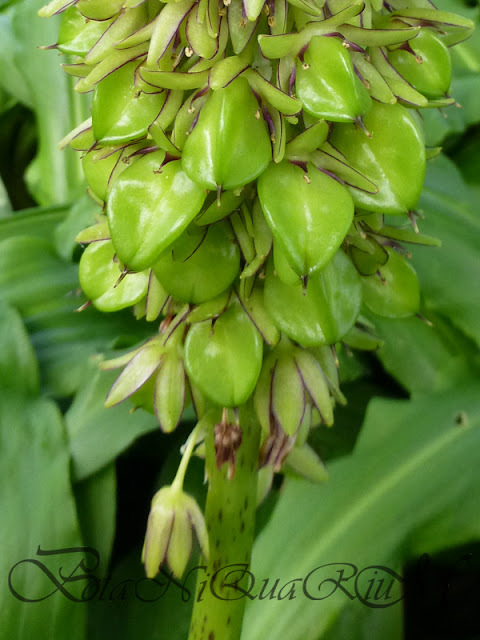 Bulbs of Eucomis species are used in Zulu, Tswana, Sotho and Xhosa traditional medicine. Bulbs and root shavings are boiled in water or milk and used as ingredients in infusions to treat pain and fever. Extracts from E. bicolor are also used to treat colic and as a purgative. Scientific research has found bulb and root extracts to have anti-inflammatory activity. Flowers last long, then followed by the first seed pods forming at the bottom.